The SuperWater Process using super critical water oxidation is designed to convert wastewater sludge, at 8 to 10% total solids content by weight, to inert products by means of an oxidation reaction. All of the organic material (including any biological matter) is oxidized. The end products are carbon dioxide, stabilized metal oxides, steam (power) and very weak clear brine that can be easily converted to pure water. To initiate the oxidation of sludge utilizing the SuperWater Process, sludge must be pressurized to about 3,800 psi and then heated to about 250°C to 275°C (in a preheater). For municipal wastewater treatment sludge, 250°C is the SuperWater Process “kindling” temperature, which is defined as the temperature at which the heat released by oxidation is greater than the rate of heat loss. Once the kindling temperature is reached, further heating (to supercritical conditions) occurs through the heat liberated by oxidation of the organics contained within the sludge feed. The maximum temperature reached in the reactor is a function of the heating value of the sludge feed, which, in turn, depends upon the solids content of the feed. The maximum desirable temperature in the reactor is about 600°C. At this temperature, all carbon and hydrogen in organic compounds are converted to carbon dioxide and water within seconds. Nitrogen and sulfur (from e.g. proteins) are converted to N2 and inorganic sulfates. The maximum temperature in the SuperWater Process is still low enough to avoid formation of NOx, and, therefore, stack gas scrubbing is not required. Because the process operates at temperatures and pressures that far exceed previous wet oxidation based systems, >99.9% of the organics contained within the waste flow entering the reactor are destroyed. The need for downstream dewatering, odorous decant tanks, problems that hindered previous wet oxidation processes, are eliminated. Clean water and energy (steam/hot water) are discharged from the reactor for capture and reuse. 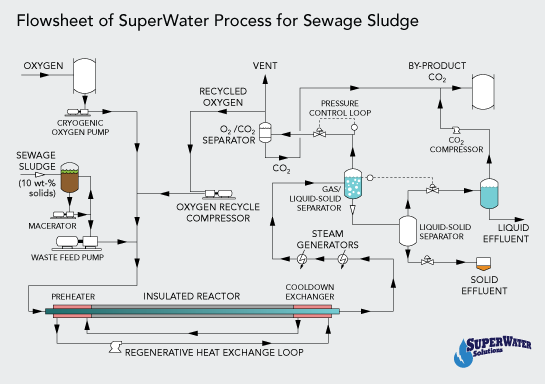 The efficiency of conversion of the energy content of the sludge (i.e., its heating value) to power in the SWS SuperWater Process is inherently higher than that of a main line coal plant with the equivalent feedstock. The reason for this is that a great deal of heat energy that is lost in a normal coal fired power plant as hot exhaust and steam exiting through the exhaust stacks is not lost in a SuperWater Process plant. There is no stack effluent and the heat of condensation of the steam lost in a coal plant is available for generating steam in a SuperWater Process plant. Therefore, a SuperWater Process plant will be at least as efficient generating steam and converting it to electricity as a coal plant. This would mean that a plant processing 10 dry tons per day (DTPD) of sludge will generate approximately 0.6 mW of electrical energy.